What's In Your Backcountry Pack? Backcountry hunting can be extremely fun. Very few adventures can rejuvenate the soul the way a backcountry hunt can. There is nothing like waking up miles from the nearest road, miles from the stresses of life and miles from the daily deadlines most of us face. However, there are a couple things that can quickly derail a hunting trip. Not having the right things in a backpack or packing too much stuff can turn any trip into a nightmare. One mistake many backcountry hunters make is bringing too much gear and food on a hunt. Jake Rush, the Manager of Outdoorsmans, says food is often an issue for many hunters. “Many hunters overestimate the amount of food that is needed on a backcountry hunt,” Rush said. “Every ounce counts when hunting miles from the road. Hunters often bring the wrong kinds of food. Loads of candy bars aren’t very healthy and the weight adds up. Almonds and other healthy snacks that are packed with protein often weigh less and take up less space in a pack than other foods.” Protein bars are one thing hunters should consider. The Wilderness Athlete Re-Bar is a great choice. Many other companies make great bars that are low in sugar and high in protein. “One way hunters can reduce pack weight is by bringing foods that are high in calories and protein,” Rush suggested. One rule of thumb is food should contain 100 calories for every ounce it weighs. By only carrying high calorie food, you can pack less food. Another important thing to consider when packing food is to pack a variety of food. On a recent Grand Canyon hike, I had one freeze dried Mountain House meal per day. My other food was either protein bars or nuts. One issue many hunters face on a week-long trip is getting tired of the same food over and over. To remedy this, they pack a variety of food and can hardly carry their pack. Many hunters pack bland things like peanut butter sandwiches and other items that don’t taste very good after you have eaten 10 of them. This is why I like protein bars and Mountain House. I like having variety. It is amazing how having a variety of different foods can help keep me mentally upbeat, which is important when hunting in the backcountry for several days at a time. 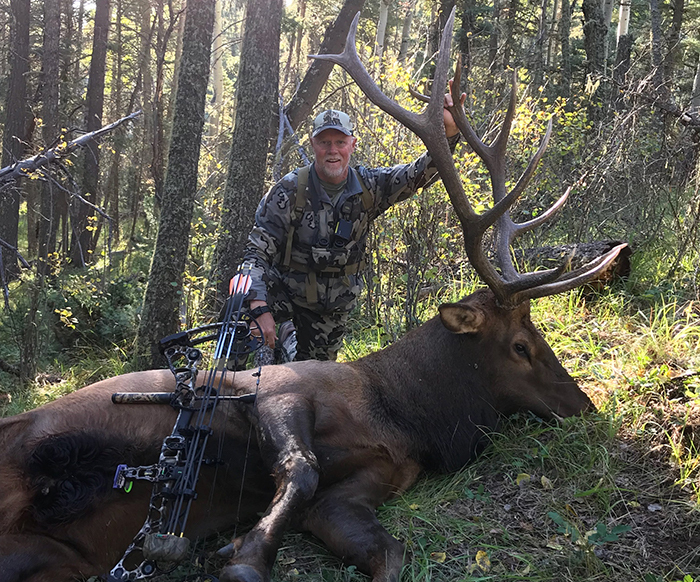 Mark Paulsen tagged this bull in the backcountry. When I hunt in places like Colorado that have several creeks and rivers, packing in lots of water isn’t typically necessary. In this case, I bring iodine tablets and a lightweight purifier. Over the years, I have used several kinds of purifiers in the backcountry and never had a problem with sickness. Iodine tablets are extremely lightweight and an option many backcountry hunters choose when they must pack light. The reason most serious hunters want to pack as little food as possible is so they can pack the essential gear that can help them harvest a buck or bull. For Jake Rush, there are a few items he will never leave home without: a pair of great binoculars and a lightweight tripod. “Many hunters greatly underestimate the value in having a great pair of binoculars and a lightweight tripod on a western hunt. Out here, we have vast sections of land, and you can’t cover it on foot. The only way to scout and hunt large sections of land is with your eyes. 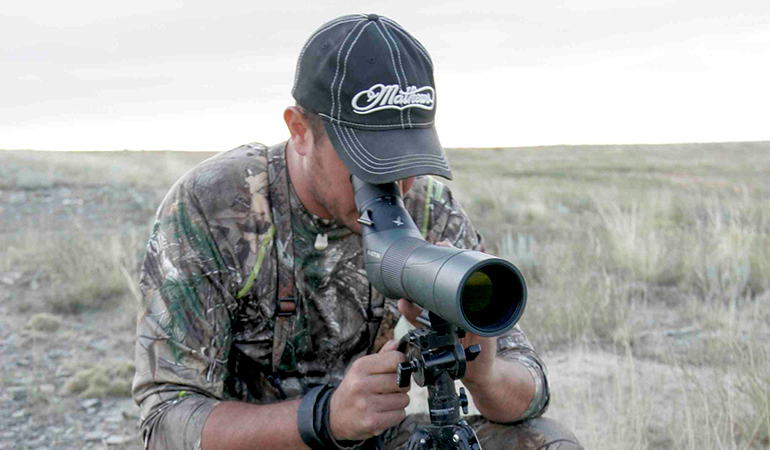 A good pair of binoculars and a steady tripod can help me spot the buck or bull I want to go after. Without good glass, it is difficult to spot game that is a long way off,” Rush explained. Many western hunters will cut back on lots of gear so they can carry their optics. One area I see many hunters cut back on is the type of shelter they take with them on a hunt. I have slept under a tarp on many western hunts and often use a Tipi when hunting. Kifaru, Titanium Goat and many others make great lightweight shelters designed for the backcountry. Whether a person uses a tipi or a tarp, the great thing is both of these styles of shelter do not have a floor which greatly cuts down on the overall weight in your pack. A lightweight sleeping bag and bed roll is also advised. 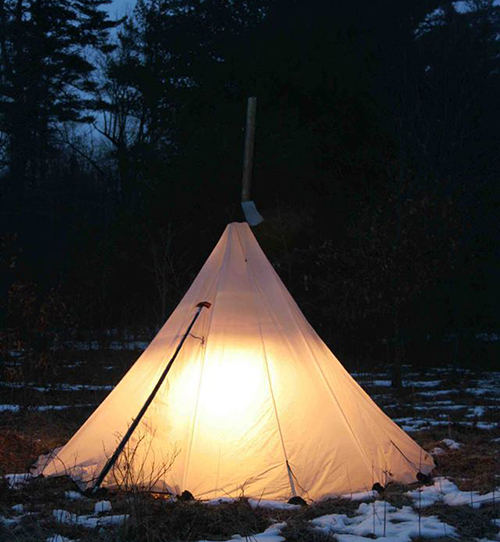 A tipi such as this one is both lightweight andfunctional in the backcountry. A quality knife or two is also important. A sharp knife can make quick working of deboning a big bull elk. A good knife can be helpful to have around camp. Many companies including Havalon and Outdoor Edge make great replaceable blade knives that are awesome for cutting up meat. Some hunters like to pack a large first aid kit; others want a solar charger to keep their phone charged. I never leave home without a SPOT emergency navigational beacon. Everybody has a few items that they never want to leave home without. The key is figuring what you can live without and what is a must on your list. “If I go on several backcountry trips and don’t use an item I have brought with me, chances are I will leave it at home on the next trip,” Rush said. Last but not least, every backcountry hunter needs a backpack that is designed for backcountry hunting. “Before purchasing a backpack, hunters should look at several different models of backpacks and buy one that fits their needs,” Rush advised. “Many packs are heavy so a hunter is carrying around a lot of weight from the start.” Hunters should keep in mind a poorly designed pack will make 50 pounds feel like 100 pounds. A well-designed pack will make 100 pounds feel like 50 pounds. When a hunter has all their gear ready for a hunt, it should be packed and unpacked several times to determine what items can be left at home so he knows exactly how much a pack weighs with all the necessary gear in the pack. Backpack hunting can be a lot of fun and a lot of work. I suggest planning this style of trip a year in advance if a person has never been on a backcountry trip before. This gives the hunter plenty of time to get the gear they need and get in shape for the trip. Mark Paulsen, founder of Wilderness Athlete, was the strength and conditioning coach for the University of New Mexico for years before he retired. He says the key to having a successful backcountry trip is getting in shape before the hunt. “Hunters should always hike and prepare their body for a backcountry hunt,” Paulsen said. “I suggest putting fifty pounds in their pack and hiking several days a week for months before a trip. This allows their body to get used to hiking with a pack. Over the course of several months, a hunter can determine how much weight they can handle on a long trip. For some hunters that is 70 pounds; for others it is only 40 or 50 pounds. The only way to know for sure is to spend a lot of time hiking and preparing for the trip in advance. One thing is certain; the moment a hunter goes on a backcountry hunting trip, they will be addicted to it. There is something about the mountain air, the sound of bugling bucks and the peace and quiet that comes with being in the backcountry that keeps hunters coming back for more.